Middle school students from across the county submitted original pieces of art to the district’s first ever Art in the Capitol competition. “The pieces included paintings, drawings, collages, prints, mixed media, computer generated art and photographs. The theme of the competition was Natural Florida. Our sincerest complements go out to all students who participated in the competition. All participants received a participation ribbon, entries designated as Best School Entry received a plaque and the entry designated as Best of Show was framed and sent to the Florida capitol to be on display during the legislative session. 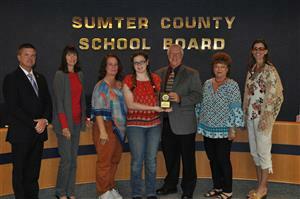 The top five entries from each school are on display at the Sumter County School Board office. 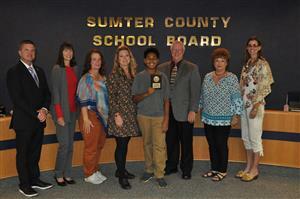 Students awarded Best of Show and Best School Entry were invited to the November 6, 2018 School Board meeting to receive their awards.